I remember it like it was yesterday. I was panicking. Panicking that I wouldn’t get in, panicking that I had made a mistake by starting a new job, and panicking that I wouldn’t be good enough. It was the first day of the Interactive Media Certificate Program, and I still wasn’t sure if I had actually made it into the program yet. I was so nervous! In the background, I had already applied and accepted a part-time job at a tech startup and hadn’t even told my job at the time that I was planning on leaving to go back to school. Everything was boiling down to that initial class meeting. I was number 42 out of the 44 people that were allowed in the class. In the beginning, it was so packed that I had to use my own laptop and didn’t even have a workstation with a desk. About two weeks into the program I was able to get a workstation that included a desk and a classroom computer, and about three months in everyone in my row had dropped from the program. Now only about 16 of us have actually stuck it out through the nights and weekend classes that have made up the last 10 months! A week from tomorrow I will have earned my certificate in interactive media and graphic design and I almost can’t believe that this journey is coming to an end! Even though I was nervous about committing to such an intense program, I have absolutely no regrets! Looking back, I am so much more knowledgeable and marketable now as an advertiser than I was back in September. These are a few of the reasons that I’m so glad that I took this program. This hands down, was the main reason I joined this program. Realistically, I know that employers don’t view certificates or associate’s degrees the same way they would with a bachelor’s degree. Even though this is something that I know that I cannot change, I learned so much more that was actually related to my field with this certificate program than through my entire education at SDSU. Don’t get me wrong, I still learned valuable things at SDSU such as AP style, media law, and some beginner Photoshop, but it wasn’t enough to take me where I needed to be. The advertising program at SDSU was taught under the School of Journalism and Media Studies. If you’re going into a career of journalism or public relations, this route is great! If you’re trying to become an advertiser, you’ll feel more prepared as a journalist by the time you graduate. I started learning a lot about content writing and social media management with my first job in marketing, but even then, I felt an overall emptiness when it came to creating advertising content. Over the last 10 months I’ve learned how to edit photographs, create vector illustrations, organize page layouts, edit and render videos using motion graphics and camera footage, make animations, and design websites with HTML and CSS. Learning even one of these skills helps significantly shape my future career path, let alone all of them combined. Before this program, I would have been able to create a flyer in InDesign or make a photo collage in Photoshop, but it wouldn’t have been held to a professional standard. My professor, James Miller, taught us about the importance of using white space, making sure your text is vectorized and not rasterized, setting up proper bleeds when sending your document to the printer. These are things that professionals in the field swear by and use to differentiate professionals from amateurs. For instance, I like cutesy things and bright colors. Unfortunately, these kinds of things can look pretty cheesy very quickly. There’s nothing wrong with something looking a little cheesy, but I’ve quickly learned where that fine line is. I didn’t have many high-resolution images of my own when I first created this blog, so I used a WordPress theme that wasn’t image dependent. Unfortunately, this made the hexadecimal code for the pink I use extremely apparent and quite-frankly, hard on the eyes for viewers with larger screens. Since now I have a Nikon DSLR camera that takes some wonderful images, I have converted my site’s theme to a much more modern and sleek design! With a lot of practice, I am now a lot more confident in my eye for great design! In San Diego there are MANY jobs in sales and marketing, but not so many in traditional advertising! My goal was always to go into creative advertising. I wanted to be hands on with the design team and help create ad copy, just like Peggy on Mad Men. Every break I got seemed to be in sales (which I’ve always been told to avoid at all costs) and marketing. I never pursued the sales opportunities, but I have pursued marketing opportunities. Even though marketing is closely related to advertising, it’s still not the same thing. What I love about my current position is that it’s at a start-up which means I do a little bit of everything! Here I can explore my passion in advertising, while using my existing marketing skills on a daily basis. I have been fortunate enough to be able to take what I’ve learned in this program and execute it in the real world with my current job! I have helped create ads, promotional graphics, and page layouts for our media kit and product specs. In most cases, they would have probably handed these tasks over to an in-house graphic designer or avoid the tasks in general. I have truly been fortunate with both this education and my job. I haven’t talked about this a whole lot, but the second half of 2016 was a very difficult time for me. I was juggling a few negative things happening in different areas of my life at once, and I felt that I was on the verge of a breakdown. Between this blog and IMCP, I was able to focus on my personal aspirations and distract myself from the things in life that were beyond my control. Something about watching your creative growth and seeing physical evidence of your hard work paying off, is extremely rewarding! I now have a plethora of skills that help me create tangible pieces and will shape my success from this point forward. Luckily many of the issues that were happening 6 months ago, have resolved themselves. IMCP kept me going when I was mentally losing strength in staying motivated. Not only can I work with programs intended for outputting print documents or still-graphics, I can now edit video, create flash animations and design web pages! I never thought in a million years that I’d feel comfortable with editing video or coding a home page with HTML and CSS. Nowadays, video is more apparent than ever in marketing and social media, so knowing how to edit and create certain effects with video footage and motion graphics is a huge plus! Also, having basic knowledge of web design has helped me with this blog and creating an external portfolio site, which I plan on publishing soon. Even though I don’t consider myself a full-on web designer or programmer, I’m glad that I now feel comfortable enough to code for myself. Considering that a few years ago the mere mention of coding made me cringe, I’m in absolute shock of what I can do now. Thanks to IMCP, I’ve met some wonderful people! My professor and classmates are all extremely friendly, helpful and encouraging. Over the last 10 months, we’ve become a tight knit family, especially as more and more people dropped out. Since my section of IMCP attends class on Tuesday and Thursday nights, along with mornings and afternoons on Saturdays, many of my classmates work full-time. Since this section does include many hard-working individuals, I felt myself both getting along and admiring the work ethic of many of my classmates. The fact that we’ve given up our Saturdays for the past 10-months alone shows how dedicated all of us are to the program! I have never been in a class with so many motivated and selfless people. Last, but not least, tuition is completely FREE! Somehow, the best skill-based/hands-on education I’ve ever received hasn’t cost me anything except for the price of the software (Adobe Creative Cloud). IMCP is payed for by a government-regulated grant, so students do not have to pay any tuition fees. The only downside to this is that attendance is pretty strict. We only have a limited amount of hours that we can miss per module. This may not sound like a big deal, but it can be if you have an emergency or if you get really sick at some point. Luckily, I’ve been able to budget my hours efficiently, but this module has been a little difficult due to a gnarly flu I had recently. Even then, I can’t complain! If you’re in the San Diego area and are looking to improve your graphic design or multimedia skills, please feel free to reach out to me with any questions and/or concerns! 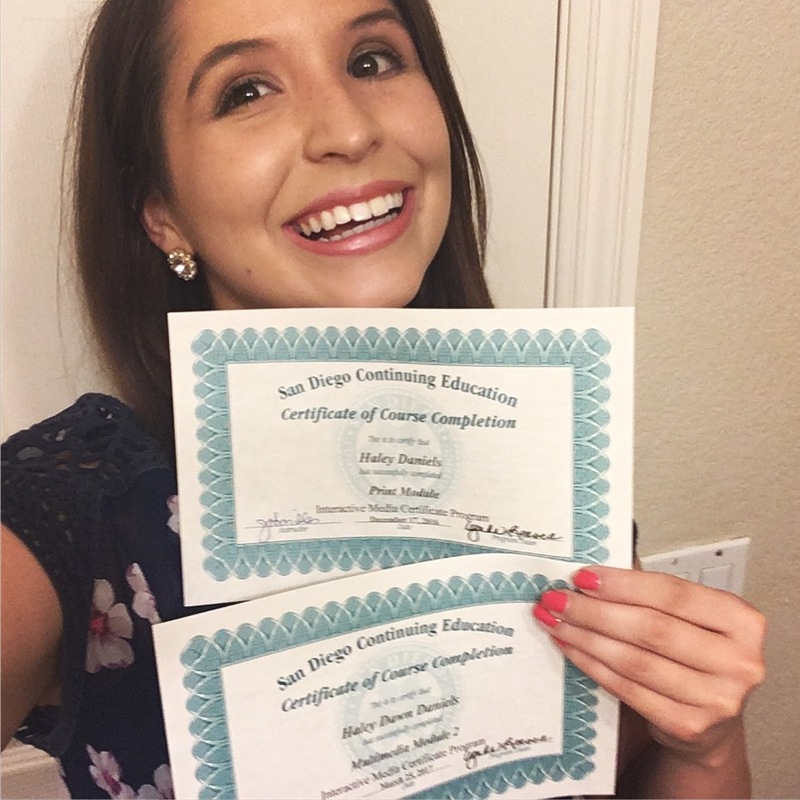 San Diego Continuing Education has multiple campuses around the county and offers many different classes and certificate programs in different fields. I highly recommend checking out what they have to offer! What is the best educational experience that you’ve ever had? I am so glad this experience was valuable to you, and that you were able to stick it out! I hope that you are able to keep in touch with your fellow students and instructor, as these can be valuable resources in the future. As for your “question of the week”, I love taking classes and learning new things. Not to mention, when you do well in a class, you get a good grade – immediate positive feedback. Unfortunately, in real life this rarely happens. It’s no wonder there are so many “professional students” running around! Thank you! Hahahaha very true! Positive feedback always generates better work in my opinion. Coleman College for a certificate in Computer Information Science in 1984! It was a lot of work but, it changed my life. It got me on the path of getting a Bachelor’s Degree and it changed my career path. Best professional decision I ever made! That’s great! I think these more hands-on programs encourage students to pursue their education even farther. It also got you a husband! lol! Great article..I am interested in this program. You said at first you weren’t for sure if you were excepted in the program. Are there certain requirements? Hi I have another question when you had orientation did you start classes that day? The reason I am asking is I go back home for a few days to Wisconsin and my flight is already booked and it is right around orientation time. I think orientation is a week or two before classes start, if I remember correctly.